Just Jingle: Skipping Stones Design and Ribbon Carousel Blog Hop Time! 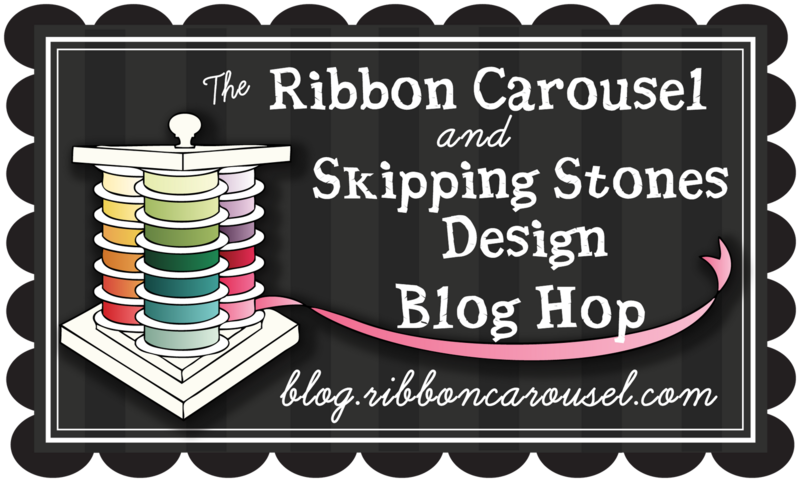 Skipping Stones Design and Ribbon Carousel Blog Hop Time! 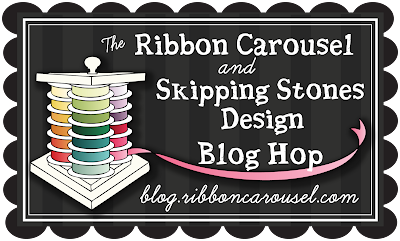 The Skipping Stones Design Team is thrilled to be teaming up with the fabulous designers from The Ribbon Carousel to bring you a blog hop that is sure to impress! Here is the card I created for today's hop! I used the Cupcake Cuties set from Skipping Stones! I love that gorgeous navy grosgrain with the fun star ribbon from the Ribbon Carousel! SO CUTE together! Hop along and leave some blog love for our designers for a chance to win one of 2 great prizes! 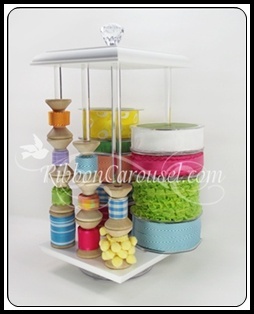 The Ribbon Carousel will be giving away a ribbon carousel and Skipping Stones Design will be giving away a stamp set of the winner's choice! Winners will be announced on Saturday at 8:00 PM EST! love that bow! it is awesome! So very cute!I love the sparkly fireworks!! Fun card, love all the white. Such a fun card, love the ribbon! This is really adorable- love the ribbon and your sparklers! love how you made the bow~so cute!!! great card!!! That bow is gorgeous and I love how you wrapped it in with the red one. Takes a great bow to the next level. Thanks for the idea! Super festive. Love that bow! Very pretty card. Love your big bow! Another cutesy CAS card to brighten my day! I love this! Knowing when to stop when trying CAS is not part of my creative abilities. I sooo admire folks who can do this. Lovely. adorable card--love me some bling! Great card and this is a bow even I can make! Lovely project and what an amazing give-away!! I love that ribbon-carousel! WOW! love it! the red star ribbon wrapped around the wide navy is so pretty. Beautiful bow - that is amazing!! Love your card. So stinking cute! Love the bow!! 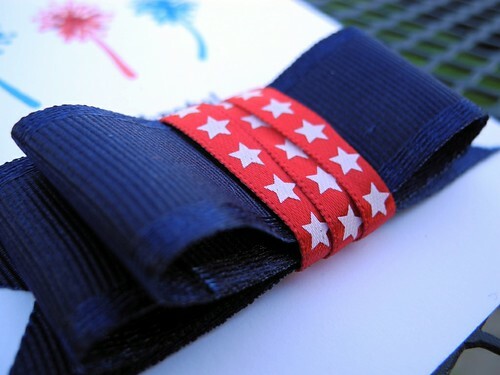 So simple, so cute and great choice of the navy blue grosgrain ribbon with the red and white star ribbon. Thanks for sharing your design and talent. Oh I love this so fun and that bow wow!!!! I love the ribbons AND your card! Your card is genius, love it, you are amazingly talented!!!! Perfectly CAS, Jingle! Love the bow you made! love this! love what you did with the ribbon! I think I need a tutorial on a bow like that! You are such a busy girl!! Love the bow! 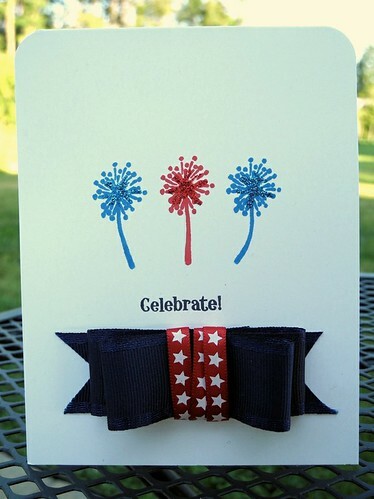 Great card for the 4th, love that bow! So adorable, Jingle! Love that wide star-studded bow! Great card! Love the sparkles on the stamps! Scrapbook Circle - August Kit Sneak Peek!!! Stampendous! New Release Blog Hop! It's Time for a Stampendous! New Release party! The Alley Way Sneak Peeks! Of Course I have a Bike On My Wall! Don't You? Shaping Up Blog Hop & Giveaway! Sweet & Sassy Christmas in July Blog Hop! Simon Says Stamp Sketch Challenge! A Pretty Hello and a Design Team Call! Just a Bit of Old Fashioned Fun!